In 1974 Steely Dan released "Pretzel Logic," their third album. It raced straight up the charts like a fairground skyrocket to peak at #8 and it seemed like the whole music community stood back en masse to ooh and ahh over it. I, frankly, thought it was okay but less than overwhelming. Considering the avalanche of momentum they had generated with the raw energy captured on "Countdown to Ecstasy" I expected to be blown away. I most assuredly didn't expect a breezy, laidback stroll along the shoreline of Hermosa Beach. I now know that co-leaders Donald Fagen and Walter Becker detested playing concerts to the point where they'd rather go hungry than tour while the other band members didn't share their starving bohemian aspirations. I also know that the constant pressure from the label fat cats to deliver another hot, steaming bowl of revenue-cultivating Top 40 hit singles along the lines of "Reeling in the Years" must have been maddening but there's barely over half an hour of music to digest here! It's almost as if their motto for this album was "shorter songs, less progressive instrumentation." While there's not a sour or misplaced note to be found it was evident to my ears that something was amiss in Danland. Fagen and Becker are perfectionists. Nothing wrong with that at all. It comes in pretty handy inside the recording studio and the pristine engineering/production on "Pretzel Logic" takes a giant, high- fidelity bullfrog leap over their first two offerings. No one says otherwise. But one of the bugaboos about perfectionism is that it often leaves too much of the human emotion out of the art being created and that's what I think occurred here. Though the tunes definitely have that undeniable Steely Dan charm swirling about them, there's just very little to get excited about. I'll put it this way. If you're enamored by the graceful tones and leisurely pace of the opener, "Rikki Don't Lose That Number," then you're going to love this collection of eleven tight tracks. It climbed up to the #4 spot on the singles chart and it's hard to argue with that level of success. It has a smooth, jazzy groove for swaying back and forth to and an unforgettable hook line that veers about as close to being a love song as Donald & Walter ever got to writing so what's not to like? (May I suggest the less-than-spontaneous guitar solo?) Moving right along, the next cut is the slick, R&B-styled "Night by Night" featuring a full, robust horn section and a large slice of big-band funk. Good dance number and the hot guitar break has a spicy kick to it but where, oh where are those mysterious play-on-word lyrics I've come to expect from these brainiacs? Has the corrupting Hollywood lifestyle robbed them of their rapier wit and their gift for the runaround? Not entirely, as evidenced on "Any Major Dude Will Tell You." Acoustic guitar and piano dominate this disarming and simply-constructed tune where Fagen's charismatic voice reassures with lines like "any major dude with half a heart/surely will tell you, my friend/any minor world that breaks apart/falls together again/when the demon is at your door/in the morning it won't be there no more..." For a weary generation that was witnessing the unfurling deception that was Nixon's Watergate while trying to comfort the walking wounded returning home from the pointless Vietnam debacle, this was a message we needed to hear. A rock beat trotting under Donald's sprightly piano draws you up into "Barrytown," a compelling piece of social satire where the singer explains how he's not really the bigot he appears to be, he's just coming clean on how things are in the real world. "I'm not one to look behind/I know that times must change/but over there in Barrytown/they do things very strange/and though you're not my enemy/I like things how they used to be/and though you'd like some company/I'm standing by myself/go play with someone else" he sings. Racial integration's fine, just not in my neighborhood. Then from straight out of left field comes an unexpected instrumental detour into the land of Duke Ellington and Bubber Miley as the ensemble gives their old-time "East St. Louis Toodle-Oo" the full Steely Dan treatment. We may never know the full answer to "why?" but it hardly matters as the whole thing is over before you know it. The slinky steel guitar ride and the lively piano solo are both grin-inducing, though. "Parker's Band" is perky pop but lacking balls and lyrically lame. Their quirky sense of humor resurfaces in "Through With Buzz," an incredibly brief, off-beat song about a guy being in an unspecified state of denial about his relationship with a male acquaintance. I really like the clever string quartet score that dances around the melody. I'm not big on the blues but by the time the soulful pitch and roll of "Pretzel Logic" arrives I'm more than ready to rock the joint and this one packs more punch than the rest of the album put together. The interesting chorus chord structure, an intense guitar ride and abstract lyrics about time travel keep it from being just another 12-bar snorer as Donald snarls "I have never met Napoleon/but I plan to find the time/'cause he looks so fine/upon that hill/they tell me he was lonely/he's lonely still." Primo stuff. "With A Gun" takes you on another surprising tangent and this time they fly off into a sort of folkish polka thing that seems to be aimed at the NRA. Hey, I like variety as well as the next progger but these tunes are all over the place. It's almost as if they were picked blindly out of a hat. But the best and most progressive song on the album saves the day. "Charlie Freak" is what brings me back to listen to this record time after time. Its simple but powerful instrumentation consisting mainly of rolling piano, bass, drums and another appearance by the string quartet coupled with an intriguing, humming, ambient guitar effect is awesome. The tune's dramatic story of a homeless drug addict who sells his last earthly possession, a golden ring, in order to score his final fix is sung with heartbreaking conviction by Fagen who portrays the buyer of said jewelry. He later goes to retrieve the body from the morgue and slips the ring back on the poor kid's finger singing "yes, Jack/I gave it back/the ring I could not own/now come, my friend/I'll take your hand/and lead you home." Its powerful imagery and slow build makes it one of my favorite Steely Dan cuts of all time. "Monkey in Your Soul" is the finale and yet another casual dip into the R&B pool for the boys. It's about the protagonist's dawning realization that his once-passionate infatuation with his significant other is waning and the time to say adios has arrived. Playful fun but it really never goes anywhere interesting. If you think I don't like "Pretzel Logic" then you're wrong. When I'm in a contemporary, adult-oriented mood I put it on and happily sing right along from start to finish. Yet it's about as prog as a Randy Newman album and the prog content (or lack of) is what I'm addressing in this review. If you have a hankering for eclectic little songs with stick-in-your-head melodies and a lite rock attitude then this will fill that prescription. But the inventive jaunts into unexplored Jazz/Rock Fusion territory that these boys took us all into on "Countdown to Ecstasy" just don't happen here and proggers who are raring to go on those exciting journeys need to know that. It's very good, no doubt, but progressive just isn't one of the adjectives that apply to much of the music included here. 3.3 stars. Countdown to Ecstasy wasn't half the hit that Can't Buy a Thrill was, and Steely Dan responded by trimming the lengthy instrumental jams that were scattered across Countdown and concentrating on concise songs for Pretzel Logic. While the shorter songs usually indicate a tendency toward pop conventions, that's not the case with Pretzel Logic. Instead of relying on easy hooks, Walter Becker and Donald Fagen assembled their most complex and cynical set of songs to date. Dense with harmonics, countermelodies, and bop phrasing, Pretzel Logic is vibrant with unpredictable musical juxtapositions and snide, but very funny, wordplay. Listen to how the album's hit single, "Rikki Don't Lose That Number," opens with a syncopated piano line that evolves into a graceful pop melody, or how the title track winds from a blues to a jazzy chorus -- Becker and Fagen's craft has become seamless while remaining idiosyncratic and thrillingly accessible. Since the songs are now paramount, it makes sense that Pretzel Logic is less of a band-oriented album than Countdown to Ecstasy, yet it is the richest album in their catalog, one where the backhanded Dylan tribute "Barrytown" can sit comfortably next to the gorgeous "Any Major Dude Will Tell You." 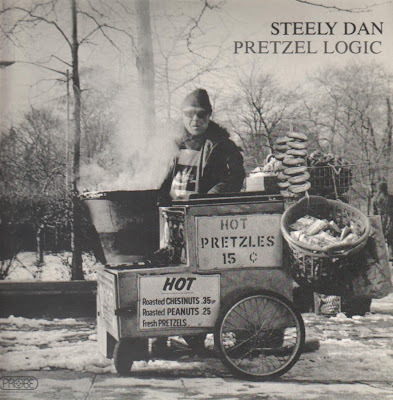 Steely Dan made more accomplished albums than Pretzel Logic, but they never made a better one. Steely Dan is the most improbable hit-singles band to emerge in ages. On its three albums, the group has developed an impressionistic approach to rock & roll that all but abandons many musical conventions and literal lyrics for an unpredictable, free-roving style. While the group considered the first album, Can't Buy a Thrill, a compromise for the sake of accessibility, and the second, Countdown To Ecstasy, to emphasize extended instrumental work, the new Pretzel Logic is an attempt to make complete musical statements within the narrow borders of the three-minute pop-song format. Like the earlier LPs, Pretzel Logic makes its own kind of sense: On a typical track, rhythmic patterns that might have worked for Astrud Gilberto, elegant pop piano, double lead guitars, and nasal harmony voices singing obscure phrases converge into a coherent expression. When the band doesn't undulate to samba rhythms (as it did on "Do It Again," its first Top Ten single), it pushes itself to a full gallop (as it did on "Reelin' in the Years," its second). These two rhythmic preferences persist and sometimes intermingle, as on "Rikki Don't Lose That Number," which jumps in mid-chorus from "Hernando's Hideaway" into "Honky Tonk Women." Great transition. Steely Dan's five musicians seem to play single-mindedly, like freelancers, but each is actually contributing to a wonderfully fluid ensemble sound that has no obvious antecedent in pop. These five are so imaginative that their mistakes generally result from too much clever detail. This band is never conventional, never bland. And neither is its material. Despite the almost arrogant impenetrability of the lyrics (co-written by the group's songwriting team, Donald Fagen and Walter Becker), the words create an emotionally charged atmosphere, and the best are quite affecting. While it's disconcerting to be stirred by language that resists comprehension, it's still difficult not to admire the open-ended ambiguity of the lyrics. But along with Pretzel Logic's private-joke obscurities (like the made-up jargon on "Any Major Dude Will Tell You" and "Through With Buzz"), there are concessions to the literal: "Rikki Don't Lose That Number" makes sense as a conventional lover's plea, while "Barrytown" takes a satirical look at class prejudice. But each has an emotional cutting edge that can't be attributed directly to its viewpoint or story. As writers, Fagen and Becker may be calculating, but they aren't cold. As the group's two foremost members, Fagen sings, plays keyboards and leads the band; Jeff Baxter, a brilliant musician on guitar, pedal steel and hand drums, powers it. As a vocalist, Fagen (who looks like a rock & roll version of Montgomery Clift) is as effective as he is unusual. With a peculiar nasal voice that seems richer at the top of its range than in the middle, Fagen stresses meter as well as sense, so much so that his singing becomes another of the group's interlocked rhythmic elements. At the same time, there's a plaintive aspect to his singing that expands the impact of even his most opaque lines. Baxter, an expert electric guitarist with a broad background in rock & roll and jazz, draws on these influences with pragmatic shrewdness. Even on these short tracks he's impressive. On one of the band's more conventional songs, "Pretzel Logic" (a modified blues), he improvises on the standard patterns without referring to a single ready-made blues. And he does things with pedal steel that have nothing to do with country music. At one point — in the vintage "East St. Louis Toodle-oo" — he duplicates note-for-note a ragtime mute-trombone solo. His command of technique is impressive, but it's his use of technique to heighten the dynamic and emotional range of the group's songs that makes him Steely Dan's central instrumental force. When Fagen, Baxter and the rest can't give a track the right touch, they send out for it. The exotic percussion, violin sections, bells and horns that augment certain cuts are woven tightly into the arrangements, each with a clear function. Producer Gary Katz provides a sound that's vibrant without seeming artificial. The band uses additional instrumentation in its live sets as well as on record, traveling with a different array each time they tour. For the current one, they've added a second drummer, a second pianist (who also sings) and a vocalist, so that now there are four singers and every instrument but bass is doubled. I don't think any of their records can equal this band on a good night. While Steely Dan for the most part succeeds in its efforts to force its character into the strict limitations of the short pop song, the music would benefit from more elaboration. Here they can only begin to convey the moods and textures that made Countdown To Ecstasy their most impressive album. But at the very least, "Rikki ...," "Any Major Dude ...," "Barrytown" and "Through With Buzz" are fine oddball pop songs, any of which would make a terrific single. In a short time, Steely Dan has turned into one of the best American bands, and surely one of the most original. Their only problem is the lack of a visual identity to go with their musical one — as pop personalities, they're practically anonymous. But with music as accessible and sophisticated as Steely Dan's, no one should care. Chuik, chuik, chuik!!! (No soy un robot, soy CucaTrap).